THE REGGIE KNIGHTON BAND – S/T: A One-Off That Is Truly One Of A Kind – Schlockmania! One of the great joys in collecting retro music is discovering a good “one-off” album. This expression refers to a situation where the recorded output of a group or performer is limited to a single album. This can happen for any number of reasons: bad chemistry within a band, an inattentive record company, a group splitting up over the loss of a key member, etc. Rock history is littered with tales of such casualties and the orphaned albums left in their wake tend to be of variable quality (in other words, a lot of performers/groups end up only putting out one album for a good reason). 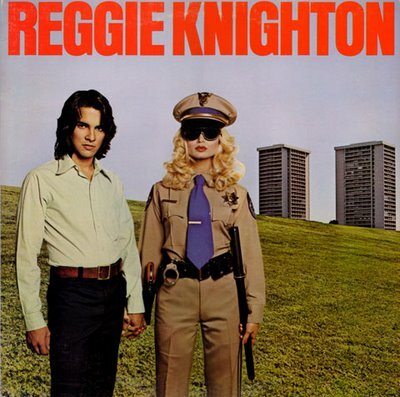 That said, the “one-off” genre does contain gems within worth hunting down and the lone eponymous album by the Reggie Knighton Band is one of them. Imagine quirkily imaginative songwriting along the lines of Sparks’ glam-era classics married to a thumping, guitar-and-harmonies-fueled sound reminiscent of vintage Queen, complete with a Cinemascope-size 1970’s arena-rock production from Queen’s original production maestro, Roy Thomas Baker. That’s exactly what you get on The Reggie Knighton Band – and the result is pure ear candy for 1970’s rock obsessives. But first, a bit of background: Knighton was a musician and songwriter who spent the first half of the 1970’s eking out an existence on the edge of the pop music scene, including a stint in the Grass Roots during their last days. 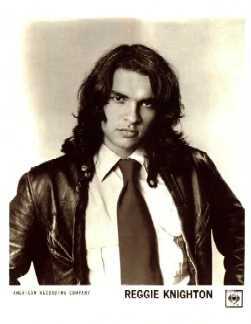 However, he eventually distinguished himself with writing catchy pop-rock tunes with an eccentric and witty lyrical slant and landed a contract as a solo artist. After a well-liked but poor-selling solo debut effort, Knighton was encouraged by his management to assemble a band to give more musical heft to his work. They also lucked out by landing Baker to handle the production for the new group’s debut. 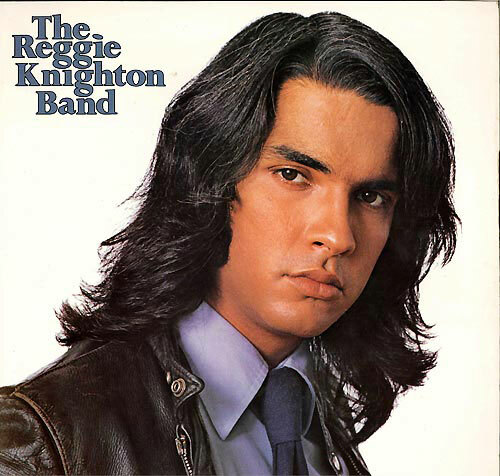 The result was The Reggie Knighton Band. It’s the kind of album that sneaks up on you: opening track “Breaking Up Inside” creeps into focus, starting with a moody rhythm-guitar line that flowers into a pumping, staccato rocker with a dazzling falsetto-harmony hook on its chorus. The lyrics have only a touch of quirkiness. Once this song sells you on the group’s chops and sound, Knighton really starts to play with the genre on the next track, “Rock ‘N Roll Alien.” The band rocks the song out with thudding drums and reggae-inflected guitar hooks while Knighton delivers a suitably impassioned arena-rock vocal but the lyrics offset the song’s rock muscle with a tongue-in-cheek narrative of an alien invader who yearns to play rock music and seduce earth chicks. After that, you’re aware that you are in for an unpredictable experience where catchy tunes and attention-grabbing riffs lock you in for bizarre lyrical flights of fancy. Subsequent song subjects include an Elvis obsessive who feels kinship with his idol because of said idol’s worst, most eccentric habits (“The King And I”) and an unfortunate soul who finds job security and steady money as a highway cop, only to lose all his friends over his five-oh status (“Highway Patrol”). The lyrics never descend into novelty-song inanity because Knighton is possessed of genuine wit and a knack for clever wordplay (sample from “U.F.O.”: “U.F.O., you and I/We just don’t see eye to eye”). Best of all, Knighton marries his oddball narratives to strong, well-constructed melodies with plenty of musical substance. The best example of his fusion of quirk and songcraft is “Clone In Love,” which takes a tongue-in-cheek narrative about a clone’s realization that any love he receives is counterfeit and makes it play like a genuine rock ballad thanks to a lovely melody that underscores the humor with heartache-y melodic hooks. Finally, it helps that The Reggie Knighton Band sounds great. Knighton anchors his songs with strong rhythm-guitar riffs and lead guitarist Brian Ray drives them all home with flashy solos. As for the rhythm section, Kurtis Teel’s bass lines have both power and a nicely melodic undertow while Glenn Symmonds puts in a powerhouse performance behind the drum kit, offering a display of can-bashing that works in lockstep with the guitars to give the album a convincing hard-rock identity. Just as important is Baker’s production, which layers the songs with great details (booming drum sounds, soaring harmonies treated with flanging and echo) and applies a compressed style of engineering to the soundscape that lends it a coiled intensity. Simply put, The Reggie Knighton Band is one of the great “one-offs” from this era. The band behind it drifted apart due to disinterest from its label and management but the work they left behind is too memorably odd and melodically strong to be forgotten. Rock Candy Records has put together a fine CD for it that impressively reproduces its punchy sound on the compact disc format and adds a great set of liner-notes that use band interviews to tell the tale of their sadly truncated career. Any 1970’s rock archaeologists will definitely want to dig this gem out. where can i find drug dealer? off the 1977 release…..
Outside of buying the original album, I believe there is an MP3 rip of the debut album floating around on the ‘net. Thank you – I loved your review of this wonderful album. Thanks for reading, Terry. This is album is truly one of a kind.